accessories What are Ryan's favourite accessories? 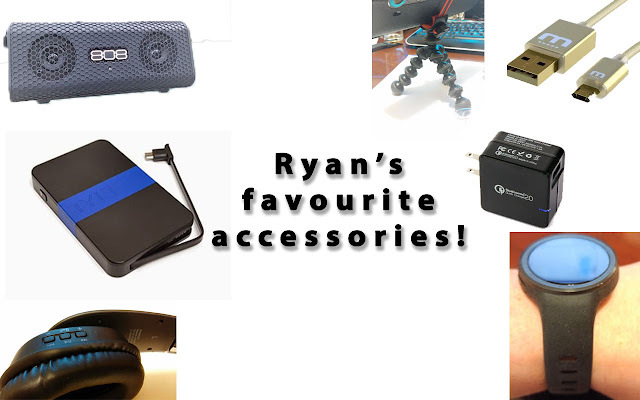 What are Ryan's favourite accessories? So, as I go through my day to day operations with my phone I have several accessories that get me through the day. Well, not that I need these items but it's something that I love to use. Serioiusly, I do not think I can go back to a non-Android Wear life. Being able to not have to check my phone every few minutes. I would like to get a new watch, and I really liked the Motorola 360 Sport. Thanks to +Rob Blaich for sending me the Horizon (I had sent it to him, but he sent it back when I had lost my previous one). I've loved using the Cheetahs during my run and having it connected to just my watch instead of my phone. Then my duos for just using it around the house, or my degauss for walking around, they're always in a jacket pocket for me. This is my go to speaker for indoor our out. Okay, once you start using rapid charge / quick charge, you really cannot go back. Mix it up with my micflip cable and it's awesome. This I use every day, at least once a day. It sits on my counter and plugs in my G Watch charger (which I have a cool 3D printed stand), my phone, my work phone, my charger for my Sennheisers and then an extra microUSB cable that'll reach out to my bed. I don't mind that it's not rapid charge as it's meant to charge over night. I loved my Tylt recharger and it was usually in my other jacket pocket... that is until I had lost it. Now this is my go-to for a charger (despite its phallic look!). Not only is it a great reversible microUSB end, it has a great braided cable so that there is no twisting or anything. Going camping there is no better device to take with me (site camping, not backpacking/portaging) as it can act as a speaker but also as a battery charger, and it's a crank chargeable). I don't often need a tripod, but when I do I like this little portable jobby.